Animal Friends: Scrub-a-dub-dub...Dirty Dogs in our Tubs! Calling all dirty dogs! 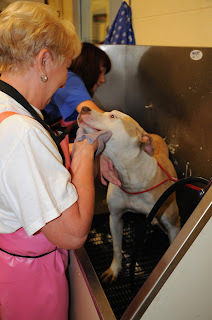 Did you know Animal Friends holds a “Dog Wash” fundraiser every month? Our volunteers will bath, blow-dry, clean ears and cut nails on any size dog (or as much of these services that fit within the 1 hour time slot) for just $25. No professional trimming is available during this program, but we promise your dog will be clean! A perfect solution now that the weather is too cold for outside baths. If your dog has never been groomed before, we will do as much as the animal allows us to, as safety is our main concern. Clients are asked to remain on site or available by cell phone during the appointment, as the volunteers will bring your pooch to the lobby as soon as services are finished. Pets must have proof of current rabies vaccinations. Call the Retail store to make an appointment at 412.847.7022.